Beisan Systems has launched an S54 exhaust upper chain guide product. The Beisan chain guide is a shape replica of the BMW chain guide, but has a solid form and is made from a superior Nylon. The BMW chain guide lasts ~80k miles and a replacement BMW chain guide will likely wear faster. The Beisan chain guide is expected to last 250+k miles. The BMW chain guide inflicts uneven wear on the mating lower chain guide, damaging it and reducing its functional lifespan. The Beisan chain guide applies even wear and reduced wear on the lower chain guide, which allows it to have a longer functional lifespan. The chain guide is easily replaced during the Beisan vanos repairs. Its replacement is documented in the Beisan S54 Vanos Rattle Procedure. The Beisan S54 Exhaust Upper Chain Guide cost is $80. The following is an in depth discussion of the S54 exhaust chain guides’ problems, engineering solutions considerations, and Beisan chain guide solution and product testing and results. Most BMW engines receive a one piece guide at each side of the timing chain. With the S54 engine, the exhaust side of the chain has two guides that mate to form the complete guide. There is a lower longer guide and an upper shorter guide. They overlap by ~1”. The chain tensioner applies force at this mating location which places tension on both chain guides. Due to the dynamics of the engine cylinders’ compression and combustion cycles and valves opening and closing cycles, the timing chain does not rotate uniformly. The exhaust side of the chain is constantly tightening and loosening. This causes the chain tensioner to constantly compress and decompress. These movements cause the exhaust upper and lower chain guides to continuously slide across each other at their mating surfaces, while at the same time be pressed against each other at this location by the chain and chain tensioner pressure. This constant sliding motion under pressure causes wear on the upper and lower chain guides at their mating surfaces. The chain guides are made from Nylon. The choice of this material is likely due to chain mating wear tolerance, environment (heat & oil) tolerance, and noise reduction; Also weight, cost, and ability to mold for cost reduction. Fillers can be added to Nylon to change its characteristics. This is usually to affect wear and friction characteristics. The exhaust upper chain guide is made from virgin Nylon, while the lower chain guide has a 20% carbon filler. The carbon filler will cause the chain guide to be more wear resistant, but will also increase its friction. The chain guides are molded (plastic injection molding) and don’t have a solid form. They have a 2.6-2.8mm thick outer surface, while the rest of the guide has a webbed structure to support the thin outer surface. 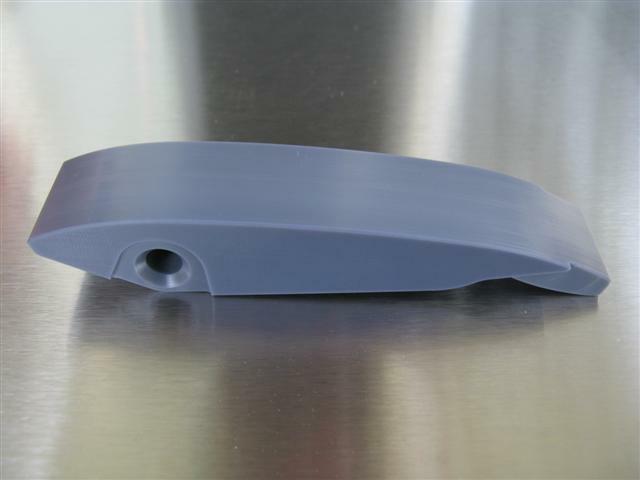 This design technique reduces weight and material cost and eases the molding process. Due to the higher wear of the upper chain guide virgin Nylon and the lower wear of the lower chain guide carbon filled Nylon, the upper chain guide mating surface wears significantly faster than the lower chain guide mating surface. Further, the carbon fibers of the lower chain guide act as a rough abrasive surface and significantly increase wear on the upper chain guide mating surface. Once the upper chain guide mating outer surface (2.8mm deep) is worn through, the main body webbing structure (4mm deep) begins to mate with the lower chain guide. The upper chain guide webbing structure at this location has the form of a cross frame. This cross frame mates with a much smaller mating surface on the lower chain guide and this concentrates the load force of the guides mating to a much smaller surface area. These significantly reduced mating surfaces then begin to wear significantly faster. The upper chain guide cross frame wears down, while a cross pattern indentation wears into the lower chain guide mating surface. Once the upper chain guide cross frame is completely worn away, the upper chain guide opposite side outer surface begins to mate with the lower chain guide mating surface. The opposite side surface (2.6mm deep) then also wears. Before this surface is completely worn through, a remaining sliver piece breaks off the upper chain guide and into two pieces. All this upper chain guide wear process and final break occurs in ~80k miles. The lower chain guide is not easily replaceable as the engine front timing cover needs to be removed to access and replace it. The upper chain guide is replaceable without removing the timing cover. The upper chain guide is relatively easy to access and replace during the Beisan S54 vanos rattle procedure repair. The crankshaft/exhaust side chain tensioner and exhaust camshaft sprocket are removed. The upper chain guide is then easily accessed and removed and replaced. A practical solution to the chain guides’ wear problem can be achieved by producing an improved upper chain guide. The lower chain guide does not need to be replaced as it is wearing acceptably and still has a long remaining life. The goal of a new design upper chain guide is to have the guide last significantly longer than the BMW upper chain guide, while not increasing, and potentially even decreasing, the wear on the lower chain guide. The Beisan upper chain guide is made from Quadrant Nylatron NSM. This is Nylon with a solid lubricant filler. 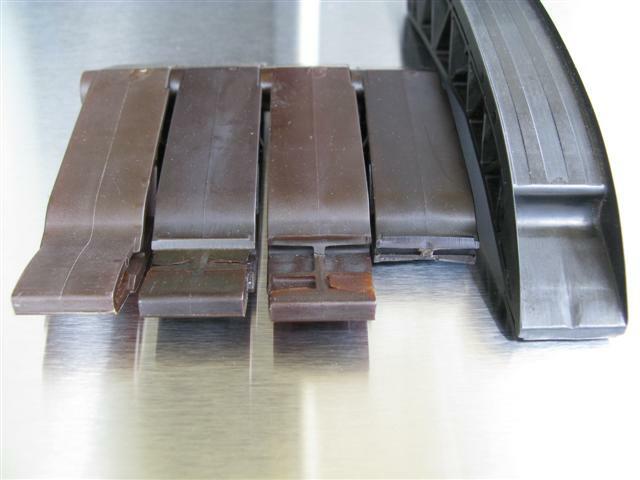 NSM is specified as having 28% less friction and 85% less wear than virgin Nylon. It is the highest rated Nylon available on the market. It is not available in resin form for molding and is only available in cast rod and sheet in varying dimensions. It is extraordinarily expensive. The Beisan upper chain guide is a shape replica of the BMW chain guide. It is machined from a sheet of Nylatron NSM. Because of this, it has a solid form instead of a webbed form like the BMW chain guide. Due to this solid form the guide mating section with the lower guide has ~4mm more solid surface depth material than the BMW guide. A test was performed to assess the efficacy of the Beisan chain guide and compare it to the BMW chain guide. Two E46 M3 cars were employed in the test. Both cars had ~100k miles. One car received a new Beisan upper chain guide, and the second car received a new BMW upper chain guide. Both cars were driven for ~1 year and had the chain guide removed at 18k miles after installation. 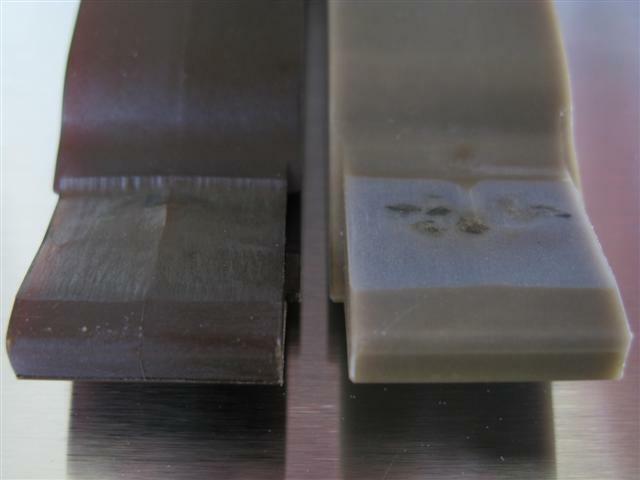 At the inner deepest wear point of the guide mating surface, the BMW guide lost 1.5mm depth surface material, while the Beisan guide lost .5mm depth surface material. Thus the Beisan guide experienced ((1.5 - .5) / 1.5) * 100 = 67% less wear than the BMW guide. This is in proximity of the manufacturer specification of 85% less wear. The mating surface depth (before webbing) of a new BMW guide is 2.8mm. Thus the expected complete wear miles of this surface is (18k miles / 1.5mm) * 2.8mm = 33.6k miles. After this surface is worn, the guide center webbing cross frame, which is 4mm deep, begins to mate with the lower guide and begin wearing an indentation into it. The Beisan guide replaces the 4mm deep center webbing with solid material. Thus the Beisan mating surface material depth is 2.8mm + 4mm + 2.6mm = 9.4mm. The expected wear miles of this surface with the NSM Nylon material is (18k miles / .5mm) * 9.4mm = 338.4k miles. There are several more aspects of the guides’ function that also influence performance results. The Beisan chain guide Nylatron NSM with specified 28% less friction will enact notably less wear on the lower chain guide mating surface than the BMW upper chain guide, allowing it to last longer. The lower chain guide will normally already have an indented cross patter in the mating surface from the original upper chain guide wear and webbing cross pattern mating. Thus a replacement upper chain guide will develop a cross pattern raised area at the mating surface. 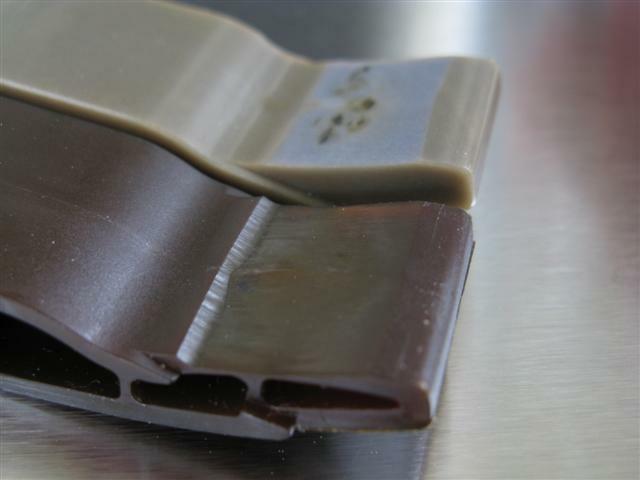 The lower guide mating surface will have already worn through the smooth low friction surface finish of the manufacturing molding and the underlying carbon fiber fillers will be exposed. This will likely cause a replacement upper chain guide to wear faster than the original upper chain guide. Thus a replacement BMW upper chain guide will not likely last the usual ~80k miles before it fully wears and breaks. This seems to be indicated by the significant 1.5mm surface wear of the BMW replacement guide in the test. Feedback from installers going forward will provide more complete results on the wear of the guides with the BMW and Beisan upper chain guides. Irrespective of the lack of long term data, it is quite clear from the 18k miles test that the Beisan guide with Nylatron NSM and solid body is a far superior chain guide to the BMW chain guide for this application. Special thanks to forum members kuksul08 and bimmerfan08. They both provided great help in the initial assessment of the failure and the modeling of the guide and assessment of materials and choice of replacement material. Apology to some owners. The first very small batch of chain guide prototypes made were received by a handful of people. The second small batch of chain guide prototypes made were received by multiple people. Unfortunately this second batch was made from the wrong material, Nylatron GSM. This was a mistake by the machine shop, but I also misinterpreted the material color change and didn’t recognize the mistake. GSM wears 12.5% faster than virgin Nylon but has 20% less friction. This guide will likely last ~100k miles before fully wearing and breaking. But it will reduce wear and prevent uneven wear on the lower chain guide as well as the NSM material chain guide. Thus it is still a superior chain guide to the BMW chain guide. I apologize to the owners that received and installed this guide that they didn’t receive the superior NSM material chain guide. As I recall, all these owners received the chain guide at no charge. Sincere apology to the many owners who installed the Beisan vanos solutions and did not have this chain guide available. It’s unfortunate it has taken this long to have this product available. All times are GMT. The time now is 08:36:48 PM.